Fishing can be a "hit or miss" sport. You can sit in one spot for any given amount of time, and never get a single bite.....or you can use the high-tech FishEyes Rod & Reel System, and COMPLETELY ELIMINATE the guess work! 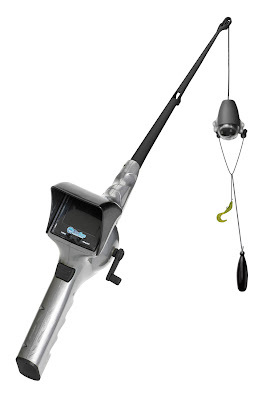 You don't have to guess anymore because the full color LCD screen shows you in real-time what is going on underwater....with the underwater camera on the line! How can you see in murkier water conditions you ask? Well, with the built in LED light on the camera of course! The LED light illuminates the area around the line allowing you to see clearly. The FishEyes Rod & Reel offers incredible quality with the most TRULY UNIQUE features I've EVER seen in a rod & reel system! Give the Fisherman in your life the gift of sight (underwater, that is!) this Father's Day with the FishEyes Rod & Reel system! Take the guesswork out of fishing! 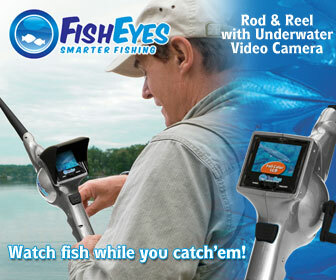 One Lucky Reader will receive a FishEyes Rod & Reel System (RV$100). Who would you love to gift the FishEyes Rod & Reel System to this Father's Day? The comment is considered your entry. Entry to this giveaway ends on July 8, 2011.Winner's are chosen randomly through random.org.The winner will be announced within 7 days of the giveaway ending and contacted through email. The winner will have 48 hrs. to respond or another winner will be chosen. My husband loves fishing so this would be awesome! We are a fishing family so this would be something we would all enjoy trying out. But my 14 year old son and my hubby would probably get to use it most! thanks so much for chance to try out a product that is new to us! subscriber of yours on YouTube! I would give it to my neighbor who loves to take his 2 boys finishing and they have had it rough the past 2 months since the 8 year old was diagnosed with Autism. I'd love to get this for my husband. He loves to take our kids fishing and he'd really get good use out of this fishing pole. My husband would get it.